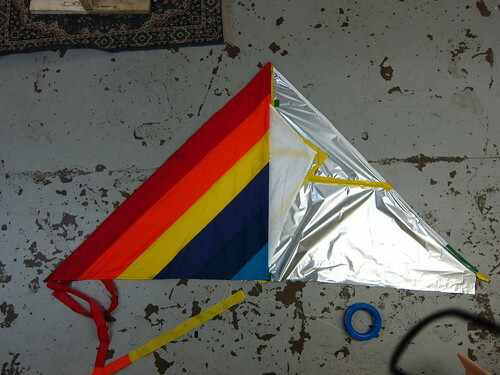 At Parts & Crafts we designed and built a quick and very lightweight delta kite with a wingspan of about 9 feet. We didn't measure anything except the 90 degree angle for the nose, and it flew pretty well! We'll be using it this week for some aerial photography. Photos of flight below. I did this Help out by offering feedback! Browse other activities for "aerial-photography"
Nice! can't wait to hear more. makes me feel like i've been wasting my time measuring things. Build questions: -- is that yellow duct tape? -- what are the spars made of? dowels? -- do the wing's leading edge spars run all the way to the nose? -- how is the spreader spar re-enforced? Design/flight questions: -- how did you pick the bridle point? -- would it fly without the tail? Sorry, should've posted more details. Thin bamboo dowels (like garden bamboo, 1/4", unsplit and in one case splinted with a second piece). Leading edge spars run the entire edge, meeting in front. Bridle point was eyeballed but i've been using 9' deltas a LOT recently so Im pretty familiar with them. that tail has so revolutionized my kite flying recently that I don't fly anything without a tail, ever, any more. But i can try it itd be interesting. I'd hazard a guess that a big tail can compensate for a lot of small design issues. Here are photos. Amazingly, it's very very close to the Dazzle Delta, which i guess means I should do those pig's weight guessing games at county fairs more... good eye for measurements, i guess? Probably just lucky. And a strong caveat -- it's flown but not under very tough conditions, not very high in the air, and not for very long... yet. It was too hot today to fly, actually, so we didn't get to test again. Also, it doesn't dis-assemble so it's not very portable. I wonder if just trash bags could work on this design??? cool- the spars sound a little thin, I'd keep it only for light wind (sub 10mph), and add some sort of re-enforcement at the ends of the spreader spar, that's the most likely point of failure. a piece of cloth or other puncture resistant material taped over the end will probably work. trash bags will definitely work, if there are re-enforcement stripes of tape and a hem--just follow the dazzle delta's diagonal rainbow stripes with some cellophane tape, and tape along all the edges. 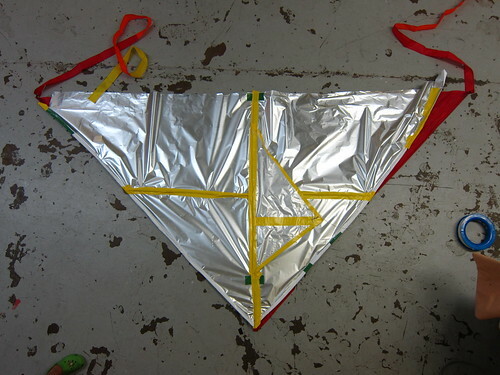 Mylar is the preferred material of super-light kite makers though. plastics are non-porous materials, unlike ripstop, which lets some air through. 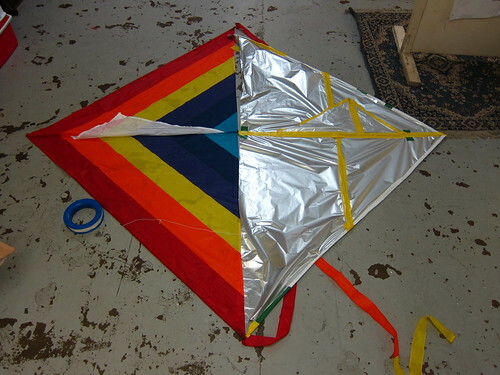 changing materials will often result in a change in kite behavior because the lift/drag profile is changed. there's no shame in flying with tail-- it compensates for little errors in construction, making kites way easier to make and flying more stable. BUT-- if it'll fly without a tail you know you've nailed a truly aerodynamically stable design.